This gorgeous figurine based on artwork by Amy Brown features a fairy and her friend! 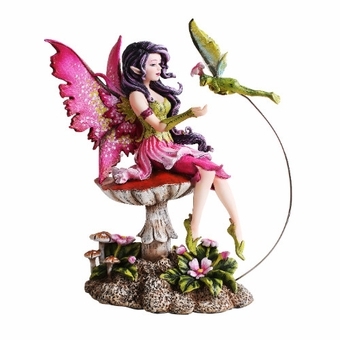 The pixie has bright pink wings and a matching skirt with a springy green top. She perches on a mushroom, with flowers blooming underneath. A winged frog presents her with a flower! A charming and unique addition to the home decor. Size: 5 1/8" x 3 1/8" x 5 3/4"